Over the weekend the Thai artist -- writer, composer, conductor -- S.P. 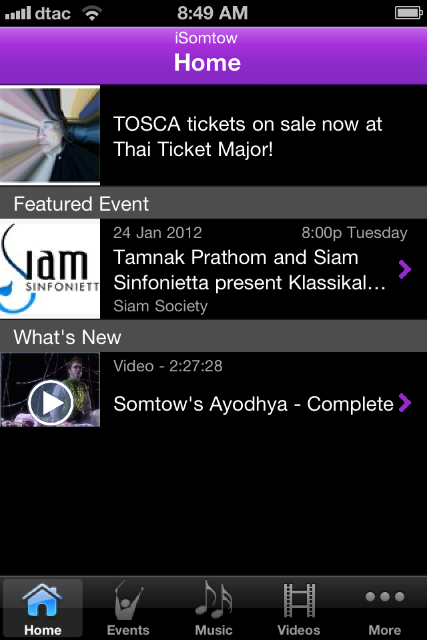 Somtow made an appeal via his blog and Facebook pages, asking people to help the Siam Philharmonic Orchestra. After a rather successful London tour that was rather expensive, he is asking for support so that he could carry on with the promise to the late HRH Princess Galyani Vadhana that one day Thailand's musicians would be able to play all of the Mahler symphonies. The appeal appears to have been somewhat successful and there were a series of comments throughout Sunday on the Facebook pages. I also made a small donation as I rather like Mahler myself. 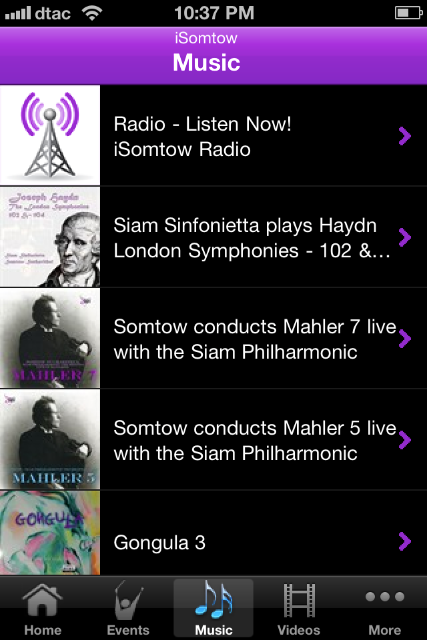 I have Symphonies 4 and 5 on my iPhone, but not Number 6 which is the next of Somtow's targets. It was probably not a coincidence to see on Monday morning on an App Store Twitter feed that there was an entry for an app called iSomtow. I had missed this before. 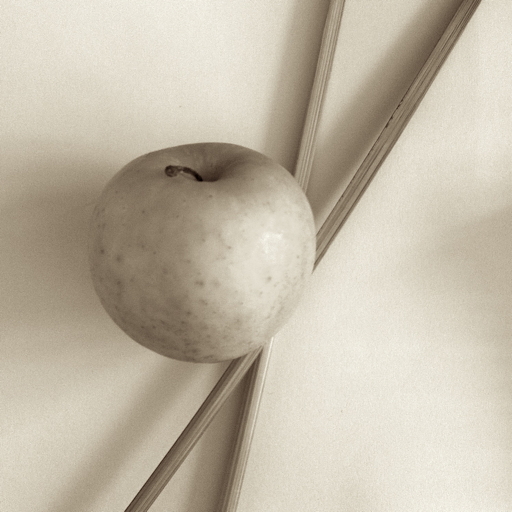 It was released towards the end of 2010, but it is a good time to be reminded of its existence and the richness that some people provide for us. 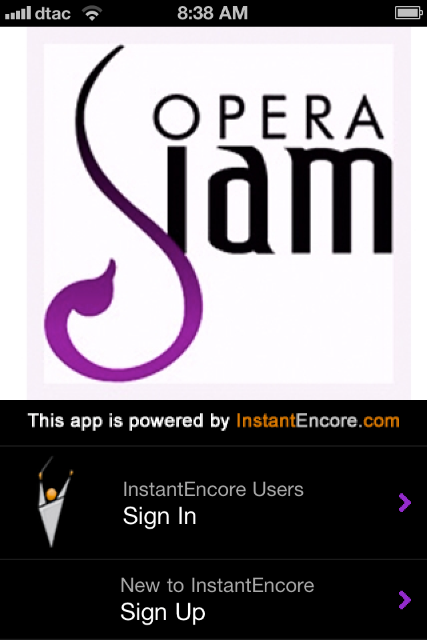 When the app first opened, there was a request that users register with an organisation called Instant Encore: a service for artists to provide websites and apps for the fans. When it came to the location, the scroll wheel had some of the world's major cities -- at least for music -- but unforgivably, Bangkok was missing. I hope that Somtow presses Instant Encore for an update to the kit that will address this omission. Fortunately, the requirement for a location was optional so I was able to leave this blank. The Home screen listed events and What's New. This included a link to the video of Somtow's Ayodhya: playing on the iPad as I write this. This is the complete 2 hour, 27 minute 27 second video downloaded via YouTube. A number of other entries on the Home Screen included blog entries, more videos and other items of interest. This may need some time to download, but with my home wifi system there were no delays or interruption. 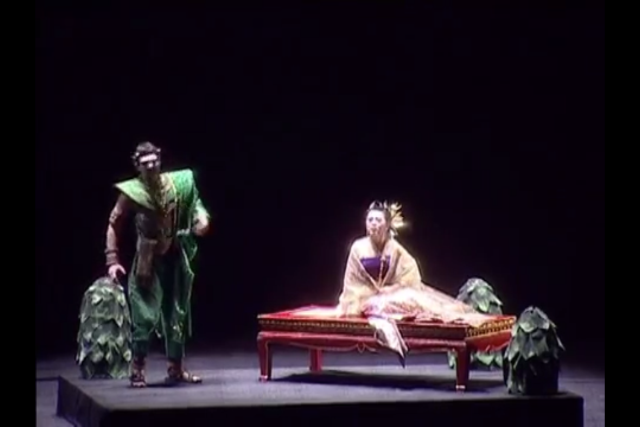 There are not many apps (or composers alive today) who will give access to a complete opera. Tool icons at the bottom of the screen are Home, Events, Music, Videos and "More". The More links to Buzz, Photos, Online Profiles, Settings and About. As an indication of how the subject of the app is something of a media machine, this is about Somtow, not about the app. But then, the whole app is about the music that orbits this one man. The sections themselves are split into sub-sections with Buzz displaying All, Podcasts (empty), News and Blogs, which made the bulk of the content. There were a limited number of images in the Photos section, while Online Profiles was a series of links to sites: Facebook, Official Website, YouTube and Instant Encore. Setting were fairly basic. These concerned the user login and audio quality. The other main sections are Events, Music and Videos. This section listed three upcoming concerts, with one Tamnak Prathom and Siam Sinfonietta, presenting the Klassikal Kidz Series 1 tomorrow (24 January) at the Siam Society, Bangkok. The page includes a link to Google Maps which requires a user to leave the app (a warning is given). The Mahler 6 performance is also listed for 16 February at the Mahisorn Hall (way up at the north end of Bangkok if the map is right). The section marked Music had a variety of media accessible, the first of which was a radio station: iSomtow. The output of this Internet radio appeared to be from the 10 or more other entries listed: a mix of classical music from Thailand and the west, including Mahler's Symphony Number 9 in D major, plus Mahler 5 and 7. This will keep me going for days. The section of videos was equally generous. As well as Ayodhya there were several other performances plus clips of the London tour, along with interviews and other videos related to Somtow and the music. At the bottom of the list was "Load more". The app works as well on the iPad as on the iPhone, although there is not an optimised version for the larger screen device. Display is in the x1 or x2 format, with a slight loss of video quality when displayed in the larger format as is usual for such apps. As with the plea for funds on the Facebook made the day before, the app had a number of items that could have done with better links to outside, such as an entry on the Home Screen announcing that tickets for Tosca were on sale. This had no link at all, and it would need a user to leave the app and search for -- or link to -- the Thai Ticket Major site (a messy display that is overloaded and needs a login to buy tickets). Having made a success of writing with sales of several million books and some excellent reviews, music is now apparently Somtow's first love. This generously endowed free app will give those unaware of his output an excellent overview, while those familiar with the composer and conductor can keep up with the prodigious output. We wish him well with the drive for support to enable the Mahler work to continue.